Most of us agree that one of the most important traits a good physician needs is a kind bedside manner. But how does one teach understanding and empathy? Alma Bobb, 103, joins Dr. Dennis Gingrich to share her insights on aging with first-year medical students from Penn State College of Medicine. 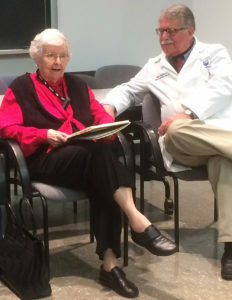 Recently 103-year-old Hershey resident Alma Bobb took on the role of “teacher” as she shared her first-hand knowledge of aging with medical students at Penn State College of Medicine in Hershey. As part of the humanities curriculum for first-year medical students, Dr. Dennis Gingrich, a family physician and physician educator at Penn State College of Medicine, invited Bobb and two other seniors to meet with his students. After showing students several video clips of “stereotypical” seniors, Gingrich’s special guests spoke about their experiences and answered students’ questions. This invaluable lesson teaches aspiring medical professionals to interact with their future patients regardless of age. Bobb confidently addressed students in the packed lecture room with her bright, hazel-green eyes and a contagious smile which reveal her positive attitude and support her mantra, “Don’t’ be afraid of age.” She walks easily without assistance, crediting her youthful gait to many years of dance study as a child and the professional dance career that took her to Europe as a young adult in the 1930s. Using her training as a performer, Alma rehearsed her hand-written speech called “My Ode to Aging,” several times in advance. She relied on her notes for the presentation, she explained to her audience, because forgetfulness is one of those things that happens during the aging process. Bobb suggested students consider the basics of their patients’ life experiences because a person’s family, economic and educational environment, whether they have siblings and even birth order help shape a person and his/her needs. Noting that becoming old is a good fortune that includes ups and downs, she shared the two main events that changed the course of her adult life: losing her spouse in 1982 and giving up driving, which she did voluntarily at age 90. Among the “ups” that help her sustain her current lifestyle are good eyesight which allows her to continue reading, a love she shared with her father, and being able to show hospitality, as her mother taught her. She told the students that she continues to lead a fulfilling life and continues to travel, typically by train. She believes that part of her longevity is the result of her family genetics and some life choices. Her diet has never been too restrictive, she eats what she enjoys not necessarily what she believes is good for her, and she has never smoked. Gingrich suspects that her attitude plays a big role, too. “Attitude makes a big difference in a person’s life because it impacts how they handle problems as they arise,” he says. Gingrich says the session on aging is one of the most popular lectures of the semester with the potential for high impact, especially on students who may have little or no experience with older relatives or friends.